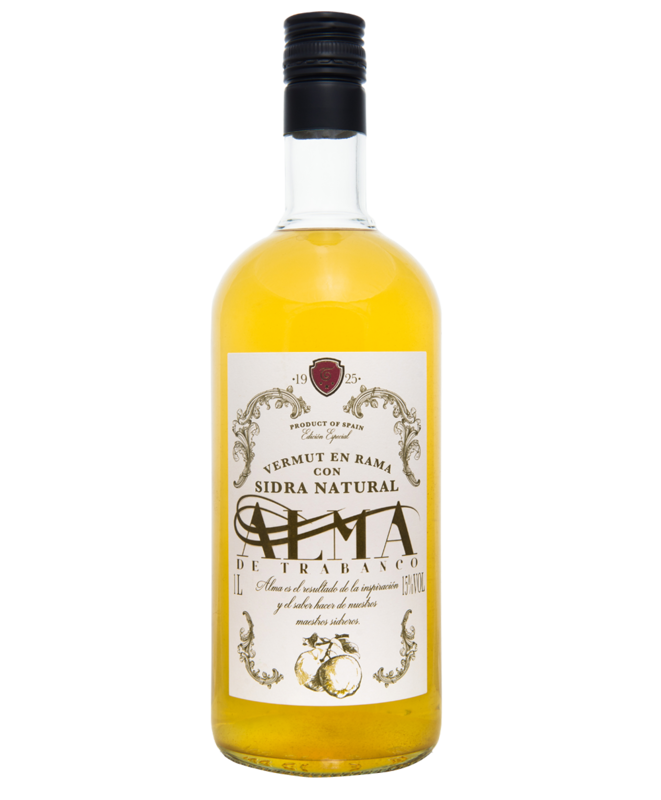 This is the first white vermouth made from natural cider and is a raw (unfiltered) product to maintain the essence of natural cider. This vermouth comes from the memory of those times when Emilio Trabanco added (in secret) a jet of cider to the vermouth to make it more tasty. Inspired by this memory, we combine white wines, cider and a great variety of botanicals (wormwood, dictamo, artemisia, gentian, boldo, cinnamon, star anise, coriander, hazelnut, thyme and vanilla) and fruits (cherry, orange peel and lemon). The final product is stored for 30 days to promote the combination of aromas and tastes. Wide glass, low Capri model, a solid Premium ice stone, 10 cl of Alma de Trabanco vermouth and a sheet of green apple skin. The ideal temperature for consumption is 8 degrees. White glass bottle of 100 cl. Cardboard box of 6 units (non-returnable). At first sight it presents a yellow straw color, due to the cider in branch. Aromas of wormwood, orange and apple appear on the nose. In the mouth it is perceived an unusual freshness in a vermouth, motivated by the slight acidity of the cider. One perceives memories of cinnamon, and a bitter end typical of good vermouths.